mike runs away from home | A little boy becomes a little man. A little boy becomes a little man. I went to the Blaydon Race on the ninth of June (for anyone who needs a translation of the above). I’d put myself under quite a lot of pressure going into the race because – unlike the race in London – this one was a sufficient amount of time after returning from altitude to make me expect to run well. This years race marked the 150th anniversary of the first singing of the song, which was written in 1862. Geordies love their tradition, so it was a shame that seconds after the gun went the rain, which had been falling for the best part of two days anyway, suddenly turned biblical. The Scotswood road turned into a river, but at least the conditions were mirroring those of 150 years ago when apparently ‘the rain it poor’d aw the day an’ myed the groons quite muddy.’ I have no idea what a ‘groon’ is, but I’m sure they were pretty muddy this year too. The temperature dropped pretty sharply too – to the extent that when I discarded the old t-shirt I’d been wearing to keep warm before the start, one of the Ethiopians promptly grabbed it and put it on under his vest! Max’s advice was going into the race was a typically succinct ‘make sure you kill yourself, but not in the first three miles,’ so when a lead group consisting of the five Africans and Ian Hudspith from Morpeth went out hard I decided to stick in a second group of four, and to keep as low a profile as possible in the group until we got to the three mile marker. Possibly because the rain was so hard we could barely see, I didn’t actually notice the signs for one and two miles, so I was quite surprised by how quickly we hit the three mile mark and by how good I felt. I decided to wait until I thought we were about half a mile from a section of the course where you make a u-turn and run back on yourself, and then to hammer it as far as the turn so that I could see what (if any) damage I’d done to the group when we turned round without having to look over my shoulder. By the time we got to the turn, I’d managed to whittle the group of four down to just Luke Cragg and I, and we worked together for the remainder of the race. Given that he’d won one of my last races before going to Ethiopia (the Alsager 5 mile race) and that I’d finished 14th, being able to run with him until the last 200m is a good confidence boost. I finished the race in 8th position, and 3rd non-African – a huge improvement on last year’s 18th place. I’m not sure how accurate the course measurement is, but my time of 28.10 for 5.9 miles would also undoubtedly translate to a 10km PB. In a way it’s a shame that they don’t extend the race to a 10km, as it would be a fast course. They regularly change the route, but keep it to 5.9 miles for the sake of tradition. Given that the song on which the race is based is about a bus journey to a horse race, and that it doesn’t mention a road race – let alone one that is specifically 5.9 and not 6.25 miles – though, I don’t really see why they couldn’t extend it a bit. 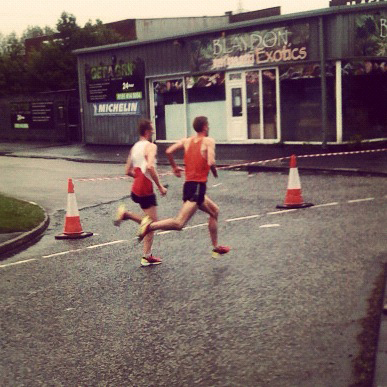 Luke Cragg and I, with about four hundred metres to go. I’m going to be keeping this blog going for the remainder of the summer and into next winter with a slightly different format. I’d like the blog to take the form of a comparison of my training with the training that the likes of Mike McLeod, Charlie Spedding and Brendan Foster used to do back in the day. I’ll be contacting the aforementioned and hopefully speaking to them and having a look at their training diaries. Given that they’re probably pretty disappointed by the state of distance running in the North East now compared with when they were running, I hope they’ll be willing to see this as a useful case study towards finding out what’s going wrong. So far I’m thinking of changing the name of the blog to ‘Acceptable in the ‘80s’, but if anyone has any better ideas I’d love to hear them! It has taken me a little while to get round to writing this – partially because it is proving quite difficult to evaluate the effects the altitude has had and partially because part of me wanted to wait until after the Blaydon race in the hope that I’d have a really good run and prove unequivocally that going to Ethiopia had the desired effect. I’ve been feeling better every training session since I returned, but as well as the altitude, I also did the most consistent 11-week period of hard training I’ve ever done, so it’s difficult to say whether that led to the improvement or whether it’s the red blood cells. The race in London was definitely just a little bit close to when I flew home. The journey via Cairo had deprived me of a nights sleep, and my legs still felt pretty heavy on the morning of the race. Once the race got started I realised why people say that you need to acclimatise back to sea-level. Whilst my breathing was completely controlled, I felt like I was stumbling in my attempt to get my legs to move at the speed I wanted them too. After three months during which there had simply not been enough oxygen in the air to run at such a fast pace, my legs just weren’t quite ready yet. Luckily the pace was pretty slow, and a fairly large group went through four kilometres together. I kept trying to avoid Mo Farah, as I was terrified of tripping him by accident (imagine the response from the media if he was injured two months before the Olympics) but he kept popping up alongside me. I was actually quite relieved when he eventually decided that enough was enough and went to the front of the group to start pushing the pace. I ended up running a fairly even-paced 31.03 for 21st place overall and about 16th in the British championships (there were a few Japanese runners and a couple of other non-Brits in there). A solid result, but not the breakthrough I was hoping for. On the plus side, I have been getting faster and feeling better ever since I got back into proper training following the race. My legs seem to have caught up with my lungs, and I’ve done the best three track sessions I’ve ever completed in the last week. It takes red blood cells between ninety and a hundred and twenty days to die, so I theoretically have a big window of time to get some solid training in and continue to improve. As Max keeps pointing out though, nobody cares about what you can do on a Tuesday night at Maiden Castle track in training. I’m looking forward to getting to the start line in Newcastle on Saturday night to really find out what kind of shape I’m in. As the Blaydon race is always held on the 9th of June (in accordance with the song) the competition is always stronger when the 9th falls on a Saturday as it gives more people an opportunity to travel to the race. I’m choosing to see this as a positive thing – it offers me a decent opportunity to beat a few people I wouldn’t normally expect to beat. We’ll see. – A sheep being worn as a backpack. This is achieved by draping the sheep’s front legs over your shoulders and tying them its hind legs, which are around your waist. My favourite exponent of this technique was also riding a bike. The sheep didn’t actually seem too concerned by the arrangement. – Strangers who are dining alone in restaurants being invited to join other groups. This is often very insistent – people here seem slightly offended by people eating alone. When I went out for dinner with Mersha, Gudisa and Anthony on Thursday evening, Mersha invited a woman to join us and then proceeded to feed her mouthfuls of injera (from his hand) across the table. Apparently this is completely normal here. – The driver of a minibus stopping for five minutes to continue to flirt with a female passenger who wanted to get out, in spite of the protests of other passengers. Eventually he locked the door and told her she couldn’t leave until he had her phone number. Luckily, she seemed to think this was charming and complied, so we were able to continue our journey! – Red wine mixed in equal parts with coca cola. As I’m assuming this must be necessary to make Ethiopian wine drinkable, I haven’t bothered to taste it on its own. – “Spriss”. This literally means ‘mixture’, and refers to a shot of espresso in a cup of tea. Richard actually quite liked it when he was here. – Exclusively positive heckling from members of the public whilst running – as mentioned before, ‘izo ambessa’ is a personal favourite, but ‘Haile! Haile!’ or ‘appreciate boy!’ are still better than the singularly unimaginative ‘run Forest run!’ that you get in England. – Running is one of the only activities with which you can reach 95% of your potential by investing only two hours a day – it’s good to have something that you know you are doing about as well as you can do it. – I’m a better person to be around when I’ve been for a run. I wouldn’t want to spend too much time with me if I’d not been running for a couple of days. – Thinking time. When I’m running my mind tends to work differently – instead of thinking of practical things, it usually wanders in a way similar to during meditation or just before sleeping. On top of this, running seems to oxygenate the brain, and I always feel more alert for a couple of hours afterwards. – Stress relief. I’ve managed to avoid living a particularly stressful life for 24 years, but whenever I do feel a bit on edge, running sorts it out. I think it was Haile who said he thought the world’s mental health would be better if everyone spent half an hour a day running, and I’m sure he’s right. – Running is the best way of exploring new places. Whenever I visit a city in Europe, I feel like I get a better impression of the place by running for an hour at dawn than by walking around during the day – and I probably cover more ground that way too. – Apart from boxing (the other sport that embodies an adrenal reaction) sport doesn’t get any simpler. It’s not governed by money and facilities (like cycling, rowing or any of the other sports that Britain does well in). This means that it is far more accessible and egalitarian than most other sports – a good thing in spite of the fact that it makes it extremely difficult to succeed in! My last really hard session of the trip was a split 8km tempo run, with a 5km followed by a 3km on a flat road in Sabata. Apparently they’ve succeeded in turning me into a proper Habesha runner as I now share the other runners’ aversion to running on the road. I’m probably going to have to get used to it again when I get back to England, but having spent such a lot of my time running in forests and on grassland, the road feels very unforgiving, and my legs felt like they’d taken quite a hammering from the session. I managed to run 16.01 for the 5km, though, at the end of a hard week’s training. Mersha says this will make running 15 minutes for the first 5km of a 10km race at sea-level feel comfortable – I’ll be testing his hypothesis in six days time. Sunday May 6th 12 miles steady. Monday May 7th AM – 8 miles steady. PM – 4 miles. Hail storm. Tuesday May 8th AM – 12 x 90 seconds with 90 seconds recovery. PM – 5 miles on the treadmill. Wednesday May 9th AM – 8 miles steady. PM – 5 miles on the treadmill. Thursday May 10th AM – 8 miles of fartlek. Tired. PM – 6 miles steady. Felt good. Friday May 11th AM – 8 miles easy. PM – 5 miles steady. Saturday May 12th AM – 15 x 220m with 40 seconds recovery. PM – 6 miles. Sunday May 13th 13 miles steady. Monday May 14th AM – 8 miles easy. PM – 4 miles easy. Tuesday May 15th AM – 5 sets of 3 minutes hard, 1 minute recovery, 1 minute hard with 2 minutes between sets. PM – 4.5 miles on the treadmill with Haile! Wednesday May 16th AM – 8 miles steady. PM – 4.5 miles steady. Thursday May 17th AM – 4 sets of 300m, 500m with 3 minutes between each rep on the track. PM – 4.5 miles on the treadmill. Friday May 18th AM – 8 miles steady. PM – 4 miles steady. Saturday May 19th AM – 5 km hard in 16.01, 7 minutes recovery, 3km in 9.40. PM – 4 miles steady. Jogging back to Mersha for feedback between reps. 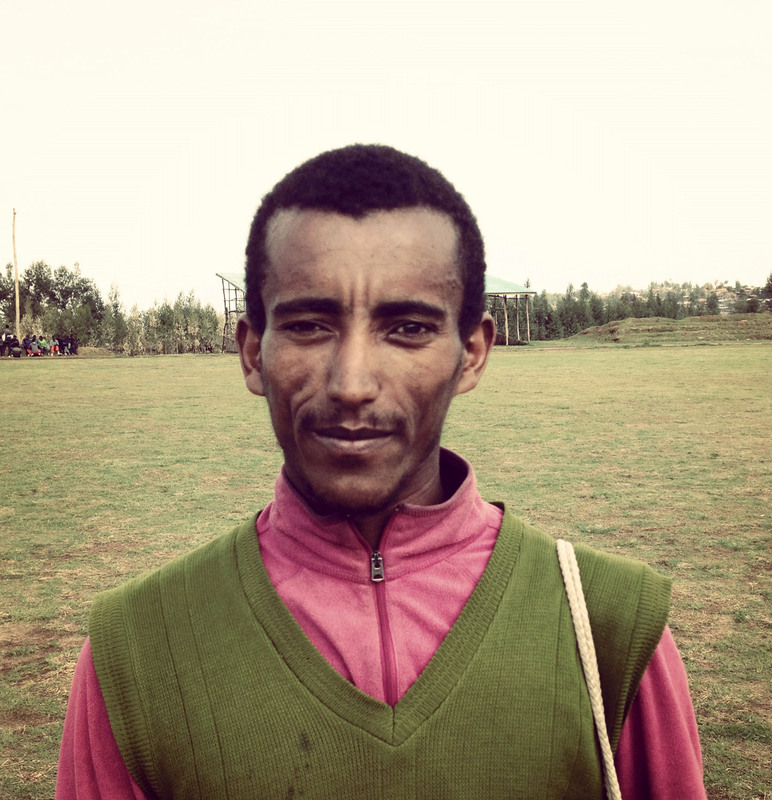 Following the track session I did last week, he told me that he wants me to come back to Ethiopia for six months to train, and to live with him so that he can make sure I rest ‘properly’ and eat like an athlete. He was unimpressed when I told him that I thought I probably had a few other things I needed to do besides run. He reckons six months is the minimum amount of time needed to make an ‘extraordinary improvement’. I should, he said, could come back and train with ‘this group’ (he gestured towards the group he was timing after I’d finished, which included Tariku Bekele and Imane Merga). That would certainly represent the ‘extraordinary’ improvement he was talking about! Whilst I appreciate his enthusiasm I don’t think any amount of intensity on the part of the coach could get me running as quick as they were, as they were running 3km reps at altitude fast enough to win BMC races in the UK. When I explained this to him, he just sighed and asked me to send the British runners to Ethiopia. It’s been good to constantly have the improvements I’ve been making put into perspective by the other runners around here – going back to Maiden Castle this will be done for me by Max (my coach) but not as directly. In Durham, the comparison tends to have a temporal element – to the runners from Gateshead Harriers who used to train there and whose times Max sometimes even has written down for comparison. There will be a couple more blog posts after my return home about what the come down is like after spending three months at 2,400m. Hope everyone’s enjoyed the blog! 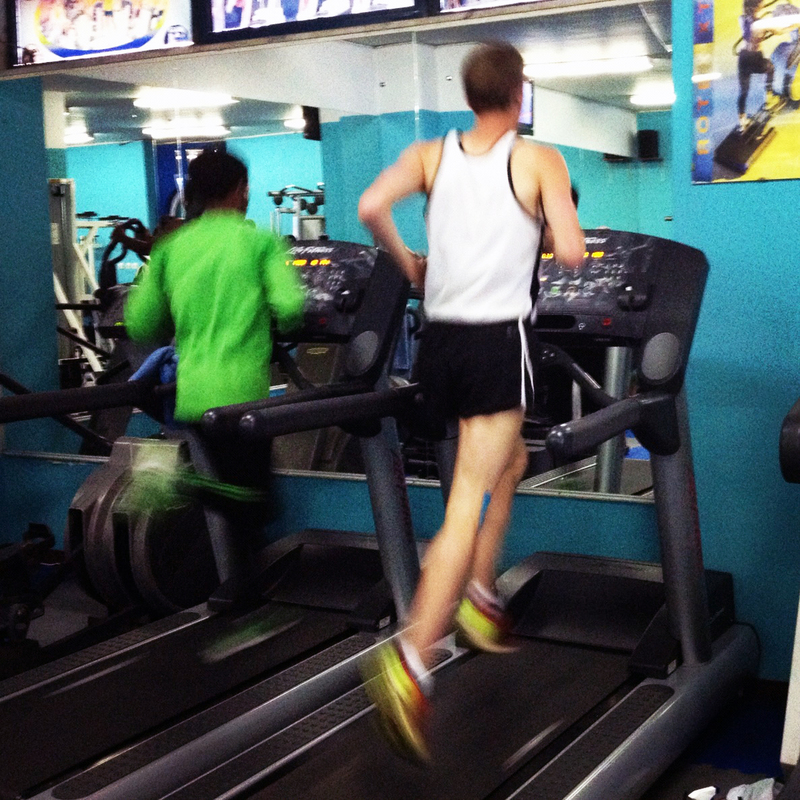 Luckily, the photo isn’t at a high enough resolution to read the respective speeds on the treadmill dials, but I think the relative amounts of blurring of our legs gives away the fact that he’s running a bit faster than I am! Last time I met Haile, it was a slightly rushed affair, as we were trying to get vests signed without interrupting his training too much. For some reason, it didn’t occur to me to spend the £2 it costs to train in his gym, and actually train alongside him. Luckily, Anthony (the latest farenji visitor to the camp) suggested it, and I actually got to run alongside the great man for twenty minutes. I must thank modern technology for this, as I doubt I could have stayed with him (he was running at 19.7 km/h) for that long without our being on treadmills! I was a bit surprised that he didn’t run for longer, but then he is racing Patrick Makau at the weekend in Manchester, so perhaps he was saving himself for that. I think, in fact, that he spent less time in the gym than anyone else – after the treadmill he did a few weights, cycled for five minutes and marched out. I suspect his business interests occupy most of his time now, as he owns the whole of the six-storey building which houses the gym, is the sole importer of Hyundai cars to Ethiopia, and set up the first cinema in Addis amongst numerous other developments. He seems to be the exception to the rule that all the athletes here spend their time resting in between training sessions! The Ethiopian National Stadium, venue for the National Championships. 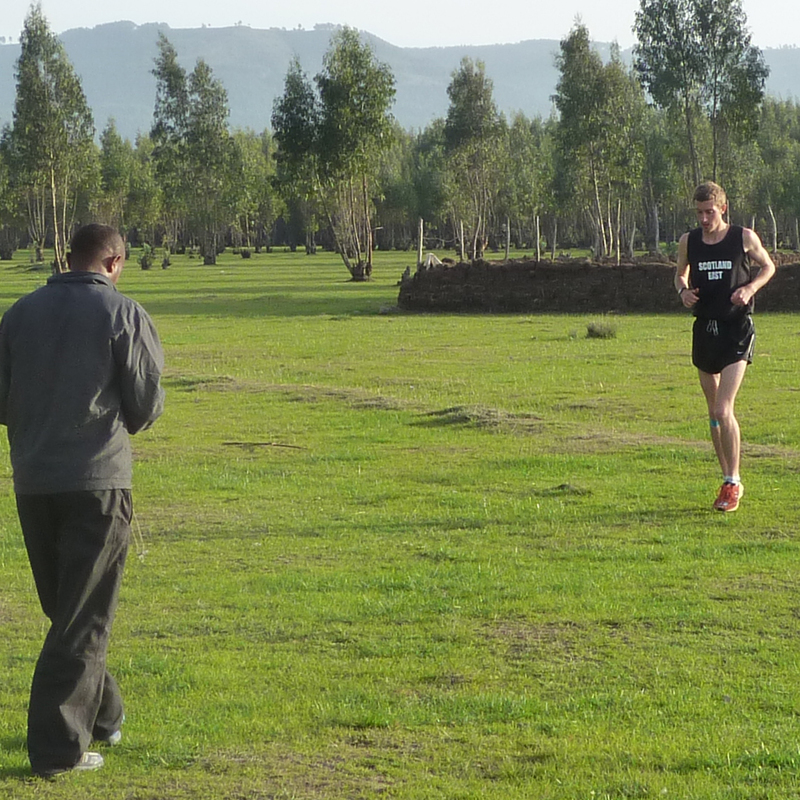 Last weekend saw the Ethiopian National Championships, and we finally managed to find out the time of the 10,000m. Unfortunately, I forgot to apply my usual rule of adding two hours to any time you are told here, and both Anthony and I got pretty sunburned as a result. Whilst this was a minor irritation for us, it must have been a major one for the runners, who had to run in the heat of the day instead of the cool of the morning. It didn’t stop them taking off at breakneck speed though, and by the half way point there were more runners in the athletes’ tent than there were left on the track. Unlike in the UK, where people have an idea of what sort of time they will run and pace themselves accordingly in order to be able to finish, there is no shame in dropping out of a race here. The crowd is of the same opinion as the athletes – if you’re not going to win, you might as well stop. The race was eventually won in a shade over twenty-nine minutes, with a last lap of fifty-eight seconds, and those that had remained in the race (around twenty runners) all finished in less than thirty minutes. The fact that these included one athlete wearing a polo shirt, football shorts and a pair of pink sandals should probably have put those who failed to finish to shame! The Olympic trials for Ethiopian 10,000m runners will be held in Hengelo, with the Kenyan trials at the Prefontaine Classic in America. Whilst there is a pre-trial trial in Kenya, to select those who will travel to the States, the winner of the Ethiopian National Championships probably won’t be able to compete in his Olympic trial. All of the well-established athletes – those with agents capable of sending them to big races at sea-level – are exempt from running the National Championships, so that it turns into a kind of B race (albeit with a winning time equivalent to a twenty-seven minute 10km at sea-level!) The fact that the National Champion doesn’t even get a chance to run in the Olympics here puts into perspective how difficult it is to make the Ethiopian team. Gudisa pointed out that most of those who competed in the race we watched could run what he calls the ‘farenji’ qualifying time, but that they don’t stand a chance with the more stringent ‘habesha’ (Ethiopian) times demanded by the federation here. I’ve now got one week to go before I fly back to the UK. I’ll be training hard until Saturday, before having an easier week to get ready for the London 10km. I’ve had 11 weeks of good, consistent training, but I haven’t raced at all whilst I’ve been here. Hopefully an easier week will put a little bit of zip back into my legs, and I’ll be able to remember how to race back at home! Yesterday I went running in the most severe storm I’ve ever seen. The belg rains seemed to have finished, so I thought that the dark clouds could only be holding the remnants of what the rainy season had to offer. When people warned me on my way out that ‘rain is coming’ I assured them that I did most of my training in Scotland and had therefore had plenty of experience of rain. What I lacked experience of, though, was running in rain that turns the whole road into a river to the extent where all the traffic has to stop. I managed to keep going for about twenty-five minutes, past people sheltering in buildings and shouting encouragement. ‘Izo ambessa’ is definitely my favourite form of encouragement – it means ‘keep going, lion.’ When the rain turned into hailstones so big I thought they were going to leave bruises – and which prevented me from seeing where I was going – I decided that enough was enough, and managed to shelter in the tin house of one of the construction site guards. 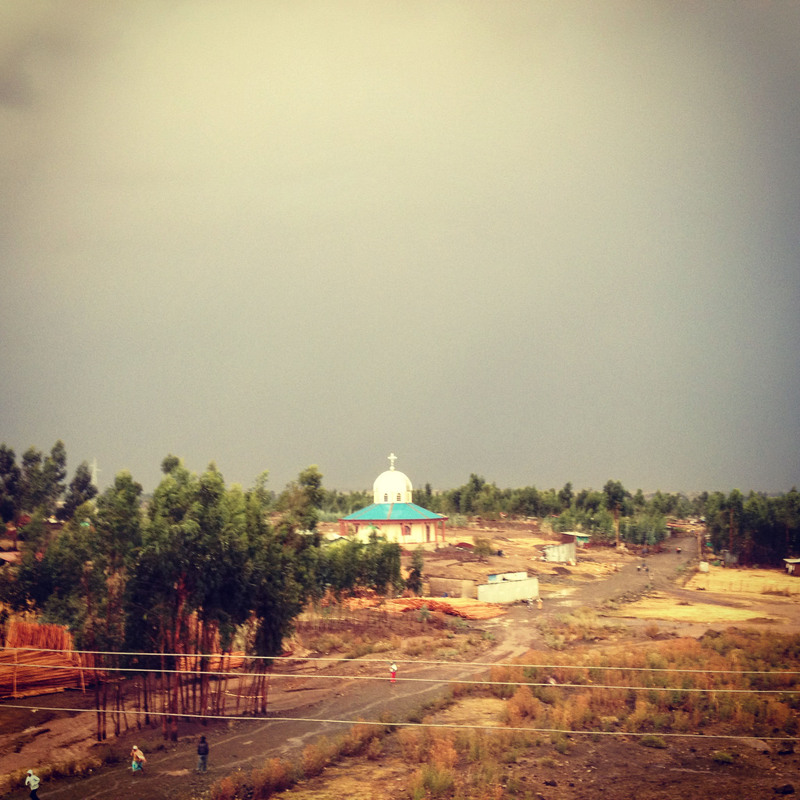 We sat shivering and watching the storm for about twenty minutes as hailstones pinballed through the door, commenting on the severity of the storm in English and Amharic and agreeing with each other in spite of not being entirely sure what the other was saying, until it abated enough for me to get home. I hope the rainy season disappears for good soon, because storms like this also have a tendency to cut off the electricity for a couple of days. I’m back to playing the game of danger treadmill in the evenings, when I run for about forty-five minutes hoping a power cut isn’t going to send me flying! On Tuesday morning we trained in Sululta, a flat grassy plain where lots of the top athletes run, and we chatted to a big group of runners when they’d finished their session. One of the things I’ve noticed is that apart from the very top runners, everyone here runs in old racing flats, donated from runners abroad. If you go to running shops here, you realise that all of the new shoes have been sold to the shop by athletes who get them from agents or shoe companies. A lot of them are even signed by the runners, and the clothing is sold in terms of which year it came out and which athlete it was sent to. The runners here are able to run in shoes that were designed to be lightweight and not particularly supportive in the first place, and which have then been worn by someone else until what little cushioning they had has disappeared, without seeming to ever get injured. I imagine this would probably be of interest to ‘bare-foot running’ enthusiasts in England. For the uninitiated, there has been a theory going round for the last couple of years (mainly due to a book called ‘Born to Run’ by a Men’s Health journalist) which says that running in plush, cushioned running shoes causes injuries by stopping the foot from working naturally and encouraging people to strike the ground with their heel. 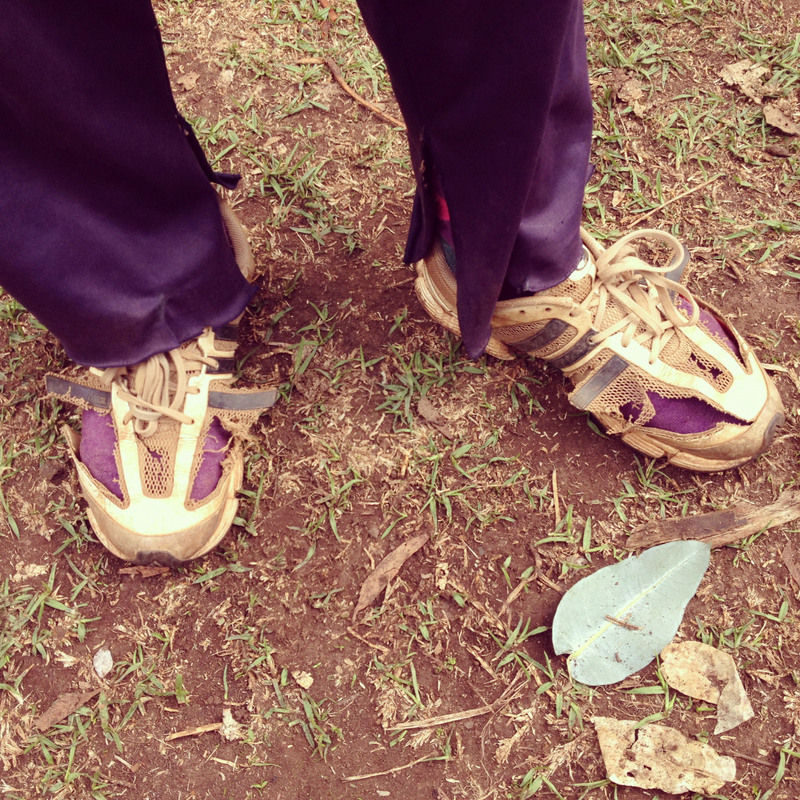 A typical pair of trainers in Bekoji, which have become a lot more ‘minimal’ than when they started! For anyone in Edinburgh, I’m going to be collecting up used running shoes in Run 4 It and sending them to Bekoji when I get back. Hopefully over the next three days I’ll be watching a bit of the National Athletics Championships here, although it’s proving pretty difficult to find out when the events are actually taking place. Mersha coaches a few athletes who are running in the 10,000m, and he seems to think the race is on Saturday morning, but when we called the athletes themselves they didn’t know, and according to Binyem, who’s in charge of the Stadium, the race is scheduled for today. I can’t imagine preparing for a championship race (especially one which is likely to be won in 28 minutes at 2,400m above sea-level!) without knowing when the race is actually going to happen. I suppose the athletes’ lack of concern shows that they’re relaxed, at least. If I manage to actually get to the Stadium at the right time for a race, I’ll try to get some photos and videos up on the blog. Sunday April 29th 14 miles easy. Monday April 30th AM – 9 miles easy. PM – 5 miles steady. Tuesday May 1st AM – 14 x 1 minute with 2 minutes recovery. Wednesday May 2nd AM – 8.5 miles easy. PM – 6.5 miles steady. Felt really good. Thursday May 3rd AM – 2 sets of 3 x 3 minutes in Sendafa, followed by 10 minutes of random sprinting. PM – 5.5 miles steady. Friday May 4th AM – 7 miles easy. PM – 6 miles steady. Tired! Saturday May 5th AM – 20 minutes of continuous hill sprints. PM – 6 miles steady. 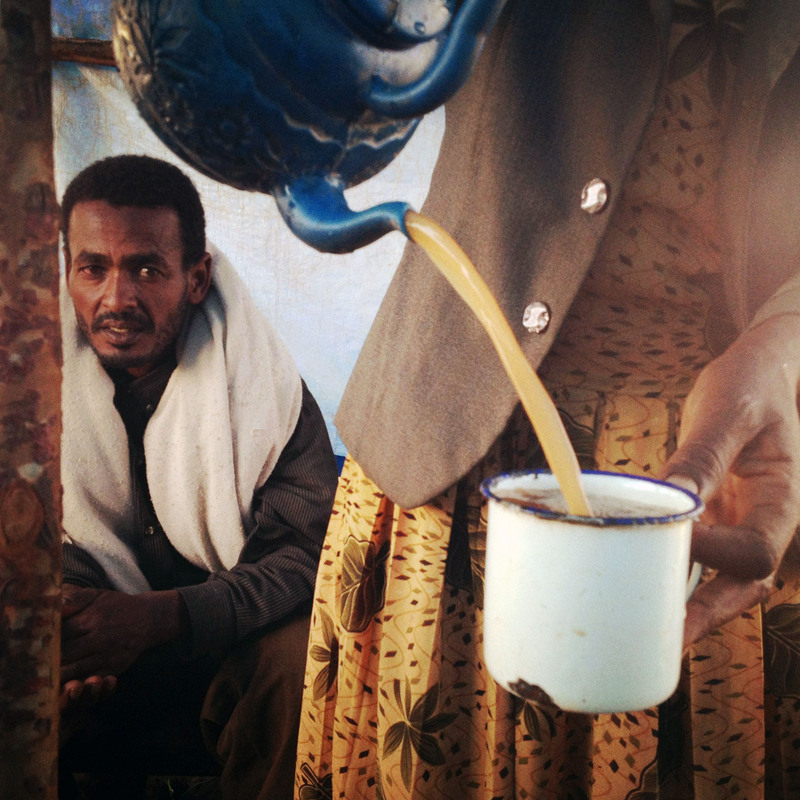 Sendafa is a pretty popular place to sell milk – it is seen as an important ingredient for recovering from training, so most of the athletes will stop to buy some on their way home, and given Mersha’s obsession with me being well rested, I’m usually forced to drink at least a litre after each session. On Wednesday night I went to a screening of ‘The Town of Runners’ with Gudisa and Edau, another runner in our training group who is from Bekoji, where the film is set. The film follows two girls as they try to make it as athletes, as well as giving a profile of coach Sentayu and a great impression of the town itself. The film is narrated by Biruk, who we met whilst we were in Bekoji, from his kiosk on the town’s ‘main’ (only) street. His commentary on life in the town, and on the gradual modernisation it is undergoing at the hands of the Chinese, is fantastic. When a mobile phone mast is built next to his kiosk he looks up at it wryly and says ‘I don’t think it will catch on.’ This was two years ago. Today, pretty much everyone in Ethiopia has a mobile, and I saw Biruk fiddling with his at the film screening on Wednesday. Coach Sentayu comments at one stage in the film that it is impossible to tell which of the runners will turn out to be the best at a young age. Unfortunately, it seems to have turned out that the two he picked out as the most promising as thirteen year olds – the stars of the film – have struggled since. Like a lot of the young athletes who graduate from the coach’s group to the regional development camps, both were forced to drop out of school to pursue a running career that will only be successful for the exceptional few. The camps, unveiled with great fanfare a couple of years ago, turn out to be hugely disappointing. The girls are sent to opposite sides of the country, and faced with sharing unfurnished rooms with 5 or six other girls and, at times, having to go hungry because of dwindling food budgets. If you add to this the fact that the residents of the towns to which they are sent react with bitterness – one comments that the town could have spent the money on a road instead of an athletics camp – you realise that the romantic vision of young Ethiopians going straight from running to school through sun-streaked fields to Olympic glory is a far cry from the truth. The other film I’ve seen so far at the festival is a documentary called ‘Salam Rugby’, about young Muslim women trying to play rugby in defiance of Ahmedinjad’s repressive regime in Iran. In spite of all of Seb Coe’s insistences to the contrary, and high-quality facilities all over the country, sports participation is still in sharp decline in Britain. It’s a shame that young people seem to lack the drive that those faced with far greater difficulties have in abundance. Perhaps having the extra obstacles actually acts as a catalyst to success. I thought it was funny that in ‘Town of Runners’, the only non-Amharic voices were Geordie ones – Steve Cram and Brendan Foster commenting on the clips of all the Bekoji-born World and Olympic champions on their way to glory. I’m not about to compare the hardship of living in the North East with growing up in a training camp in rural Ethiopia, but perhaps it had something to do with the work ethic all the great runners that the North East has produced have shown. I’m trying to get as close to 100 miles for this week as possible – mainly due to the fact that having basically written that the reason for the decline in the standard of British distance running was the lack of hard training I should probably walk the walk (or run the run). As of Friday morning, I can observe that running an average of 14 miles a day is hard work, especially when training takes place at 5.30am three days a week. 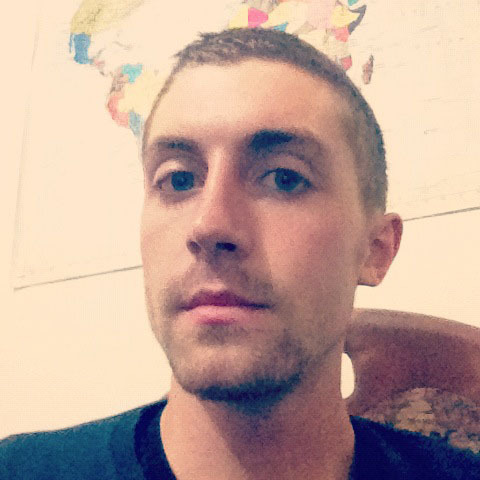 I’ve also had to spend a decent portion of this week in Ethiopian Immigration trying to extend my visa. The first day I queued from 9.30 until 11.30 to be told that the only woman that works in the office was going for a two-hour lunch break. At this point I’d had enough. The second day I made it to the front of this first queue to be told to ‘go to number 77’, which sounded like some sort of Kafkaesque side-chamber but turned out to be another queue. Being British, I like queuing. There are plenty of aspects of British culture that I don’t like, but queuing seems to be the fairest way of dealing with situations where everyone thinks their time is more valuable than anyone else’s. Ironically (given my experience of visa offices in India), the only other queue-enthusiast in the office was an Indian guy, who asked me to save his place whilst he stood in front of the woman warding off anyone who tried to walk straight to the front. When I managed to get to the front of the ‘77’ queue, I was told I needed a letter of recommendation from the Climate Change Forum. Four hours well wasted – I’ll be back on Monday. At least as a foreigner I escaped the worst of the bureaucracy – if you’re Ethiopian and want to apply for a passport it involves a four day queue to obtain an appointment for five months time. A thriving portion of the Ethiopian economy seems to be made up of professional queuers operating outside immigration. Perhaps it’s the ideal job for an Englishman. Apart from my attempt to run 100 miles this week leading to general tiredness, training is going better than at any other point of my trip. I’m no longer aware of being at altitude at all, and I’m able to run more or less the pace I would run at sea level. The other runners in the group are running a half-marathon this week, and as a sign of things getting serious before the race, coach Mersha insisted that we all stop at a farm on the way back from training today to drink fresh-from-the-cow milk. I managed to persuade him that it was probably safer if I didn’t, and Gudisa and I were allowed to take ours home. We boiled it with some ‘wush-wush’ (go-faster) tea and loads of sugar to make a kind of high-energy chai, which Gudisa says the Kenyans drank a lot of when he was there. Hopefully it’ll have the effect Mersha wants it to. He was quite keen on me running the race, but as it’s at 1,800m above sea level and Gudisa says if he runs an hour and four minutes he’ll be outside the top fifty, I think I’ll delay my half marathon debut to the Great North Run in September. 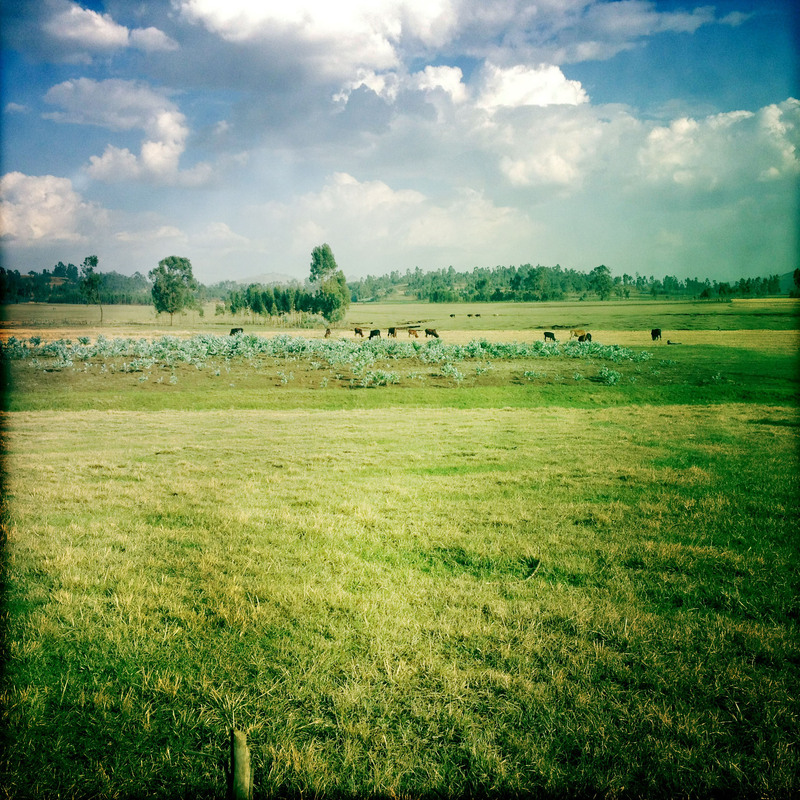 The belg rains, which have turned our forest into a bit of a mud bath, have finally stopped. This is a big boost to injury prevention, both from the point of view of not slipping on the mud, and the fact that I was doing some running on the treadmill when it was raining, and this tends to be when the electricity cuts out most frequently. I don’t know what happens when you’re running on a treadmill that suddenly goes from 15km/ph to zero whilst the lights simultaneously turn off, and I’m hoping I won’t have to find out now! The radio station to which the majority of the city’s minibuses are tuned has started to remind everyone of Ethiopia’s expectations at least several times per hour. I hope Keninisa Bekele isn’t listening, or he’ll be a nervous wreck weeks before the Olympic 10,000m starts. Every fifteen minutes or so, the commentary from the 10,000m final in Beijing is played, with the announcer describing Bekele kicking away from Zersennay Tadesse of Eritrea with excitement in his voice but also with a clear sense that it was the inevitable outcome of the contest. In spite of two years of injury problems, Ethiopians can still only foresee one outcome for the London games. I haven’t even heard Mo Farah’s name mentioned. I went to watch the London marathon in a hotel in town (until a power-cut at twenty three miles), and as everywhere else was showing football, the bar was full of athletes. Among them was Imane Merga, along with several other Ethiopian Olympic hopefuls and the Israeli Olympic marathon team (all of Ethiopian origin following a big emigration of Ethiopian Jews in the ‘90s). You would have thought that this group would have understood how difficult it is to perform on such a level, but the expectations they held for the Ethiopian athletes were just as high as those of the general public. Even before the power-cut, most of them had lost interest at the point when Feyisa Lilesa was dropped, in spite of the fact he had been running at 2.04 pace whilst desperately trying to hang on to Wilson Kipsang. ‘Lilesa has stopped,’ Gudisa told me, which meant that he’d slowed down to around 2.07 pace and would still finish in the top ten. To put this into perspective, Lilesa finished over a mile in front of the first British man, but still won’t stand a chance of getting into the Ethiopian Olympic team. I was asked this morning at training who was going to be running for Britain, and had to admit that we have only one athlete with the Olympic ‘A’ standard whilst Kenya have over three-hundred (and counting). No disrespect to Dave Webb (he’s run a faster marathon than I have), but Britain’s marathon squad must be the only one that contains a woman (Paula Radcliffe) with a faster time than one of the male team members. Attempts to explain the ever-declining standard of men’s distance running have been made for years now, but I think the basic reason is a shift in the culture of running in Britain. If you widen the base of a pyramid, its peak is supposed to get higher – so the huge increase in mass-participation running should, theoretically, improve the performance of the more serious runners. I don’t know how people jogging round marathons in four hour is really going to help anyone to run fast though, and it has skewed the perception of what represents a fast time in Britain. I ran a 10km tempo run this morning in thirty-three minutes, which I was quite pleased with given the altitude, and Gudisa just wrinkled his brow and said ‘it’s still a woman’s time, though.’ This attitude is clearly pretty helpful when it comes to trying to improve – and is probably far closer to that held by the runners in the heyday of British distance running to the attitude prevailing now. Altitude and genetics make a difference, of course. But having a large group of people training incredibly hard is probably more important. The financial incentive to run well is clearly massive here, too. Most club runners aren’t paid much (as I’ve mentioned before the basic salary is about £37 per month), but running is their job. One of the runners in our group, Indale, recently won around £1,000 for 9th at the Rome marathon, which represents roughly two years of his salary. Obviously if the rewards were quite that high in the UK it would have some effect on performance, although the likes of Brendan Foster, Charlie Spedding and Steve Jones managed to achieve what they did whilst working ‘proper’ jobs, so it can’t be overly decisive. The pressure that most of the athletes here are under explains why our coach, Mersha, seems almost personally affronted if I fail to run the times he wants me to in training. He keeps telling me that the reason I can’t run faster here is psychological rather than the simple physiological concern of a lack of oxygen. He introduced me to the National Team coach, who asked me if I was going to try to run the Olympic qualifying time for 10,000m, and then seemed offended when I laughed at the idea. He said I just needed to spend a bit more time in Ethiopia. This attitude (whilst I’m obviously fairly unlikely to run three minutes faster for 10km when I get back to the UK) can’t hurt for athletes here either. Mersha’s favourite phrase is ‘dramatic transformation.’ It’s pretty difficult to judge progress here given the altitude, but we’ll find out if his plan has worked in the British 10km championships in London on the 27th of May. Training has gone pretty well this week, with the 10km tempo run faster than anything I’ve done so far. I also had a decent track session on Thursday morning, in spite of the fact that I had to train at 6am before the National team started and had ended up drinking with a group of Rastafarians I’ve met until pretty late the night before. They’re all of Jamaican origin but have moved here to relax, play music and ‘just live.’ I can’t think of many places in the world better for doing this (or many where you could afford to!) Between them and the fact that beers cost 30p here, I always end up having quite a lot to drink at the bar round the corner from the flat. The best beer is called ‘meta’ (it’s really conscious of itself as a beer), and the barman tends to bring you a fresh one whenever you’ve nearly run out. He rushes round the tables in a long white coat, like a doctor prescribing drinks, and reminding people to ‘techawot,’ a word that lacks an English equivalent but basically means something along the lines of ‘play’ or ‘drink and relax.’ It’s also used whenever there’s a silence in conversations, when it becomes the equivalent of the English ‘this is awkward, say something.’ I’ve been put on the spot like this quite a few times since I’ve been here in spite of the fact that my Amharic is generally insufficient to come up with a particularly interesting response. Sunday April 15th 12 miles, hard as Ambo is incredibly hilly. Monday April 16th AM – 5 miles steady. PM – 8 x 2 minutes on grass. Tuesday April 17th AM – 9 miles, again very hard with the hills. 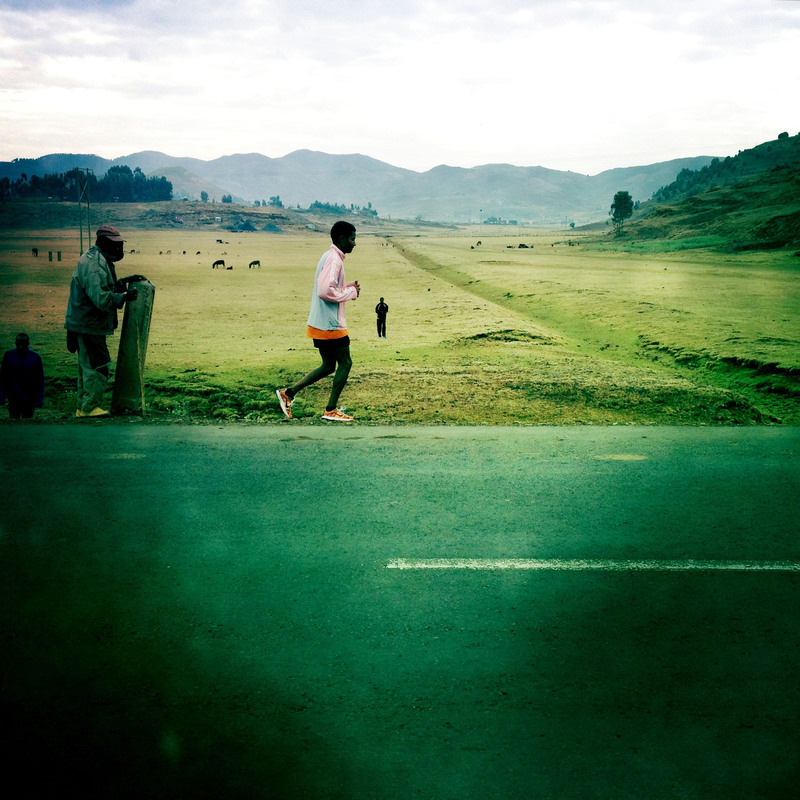 PM – Easy 5 miles back in Addis. Wednesday April 18th AM – 7 miles easy. PM – 5 miles easy. Very muddy. Thursday April 19th AM – 4 miles easy. PM 2 sets of 5 x 300m with one minute recovery and a lap jog between sets. Friday April 20th AM – 8 miles easy. Tired. PM – 5 miles steady. Felt good. Saturday April 21st AM – 10km tempo run, uphill and into the wind. Tough. PM – 4.5 miles easy. Sunday April 22nd 12 miles easy. Tired today. Monday April 23rd AM – 4,800m on track, 3 min rest, 2,800m. A strange session, but a good one. PM – 5 miles on treadmill. Tuesday April 24th AM – 4 miles easy. PM – 6 miles on treadmill. Wednesday April 25th 4 miles easy. Thursday April 26th AM -1km, 600m, 1km, 600m, 1km, 600m on track with 200m jog recovery. PM – 5 miles easy. Saturday April 28th 10km tempo run. Best run so far. After a few days back in Addis, Gudisa and I decided to make the most of the Easter holiday and go to visit his family, who live in the countryside near Ambo. Easter comes a week later here than everywhere else – another quirk of the Ethiopian calendar – and it’s not just Easter that is slow to arrive. It took us nearly seven hours to travel a hundred or so kilometres. As Gudisa puts it, only the runners go quickly here. The bus only goes so far down the dirt road towards the rural area in which his parents live, so we had a three-hour walk into a valley and out the other side to negotiate before we arrived at his house just before sunset. On the walk to Gudisa’s house. A break for ‘talla’, a kind of beer made from Barley. Gudisa had warned me that ‘the problem thing in Ambo is the hilly,’ which I had dismissed because I thought that the 300-metre drop in altitude would cancel out the difficulty. It didn’t. You really can’t run anywhere from his house without encountering lung sapping, imperceptibly steep hills, so most of the running we did was fairly slow. We managed to cover a fair few miles though, fuelled by the near constant eating that comes with Easter celebrations here. I paid six hundred birr (about 24 pounds) for a sheep for the festivities – people here eat no meat or dairy products for two months before Easter – and disappointed everyone with my reluctance to kill it myself. I did observe the sheep being slaughtered in the ‘traditional’ way, though. I think if you eat meat you should at least be willing to observe the animal’s demise, and all of Gudisa’s younger siblings seemed fascinated by the process so I felt like I should be involved. We ate mutton and injera for nine consecutive meals, usually with several neighbours, most of Gudisa’s nine siblings and a selection of their children, all crowded into the one-room house in which we also all slept. There is no electricity in the area, and apart from a mobile phone the only piece of modern equipment Gudisa’s parents owned was – inexplicably – a battery-powered loudspeaker and amplifier. They used this to amplify music from the phone and as an ingenious baby-silencing device. It turns out that if you hold a loudspeaker in front of a crying baby it is so bewildered by the sound that it stops crying immediately. 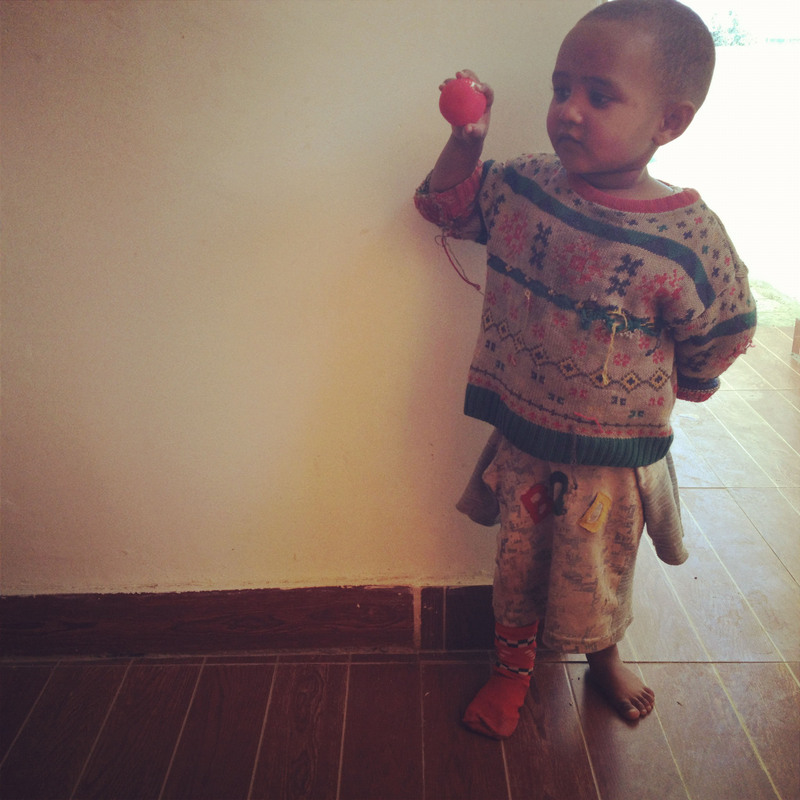 Ambo is in the Oromia region, which meant that even my limited Amharic was of little use to me. This meant that I spent a lot of the time as the centre of attention, but unable to communicate with anyone. I was, apparently, the only farenji (the word is derived from either “French” or “foreigner”) to have visited the area since an Italian soldier briefly stopped by to father Gudisa’s great-great-grandfather. Gudisa’s father’s only English phrase was “drink water!” which he encouraged me to do with great frequency. 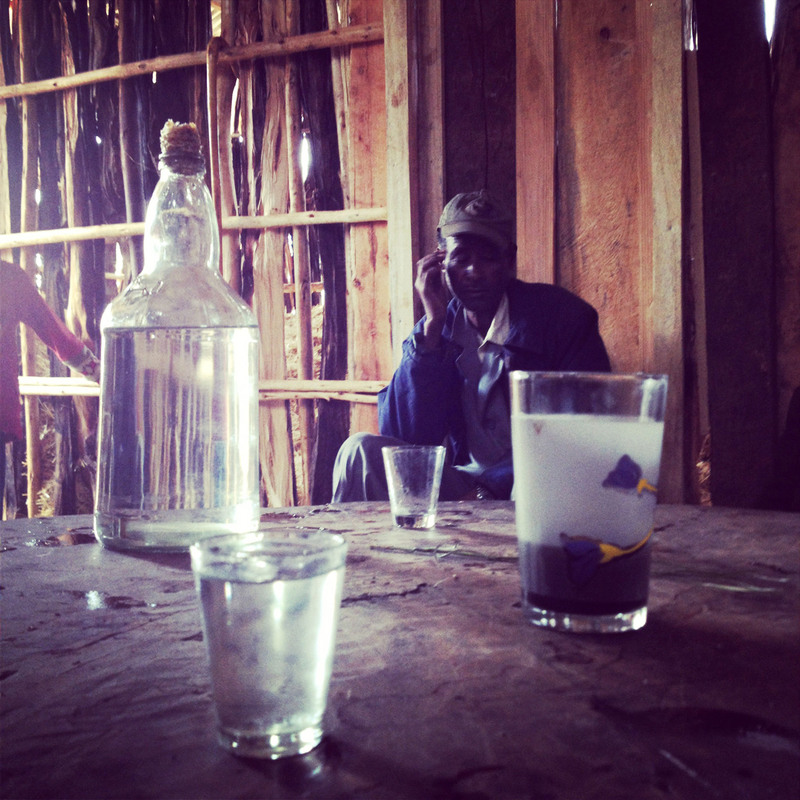 The “water” was actually areke, a local spirit that tastes a bit like eau de vie and is drunk from breakfast time onwards during festivals. We spent a lot of time visiting neighbours, who plied us alternately with coffee or areke to ensure that everyone was sufficiently caffeinated / inebriated at all times. 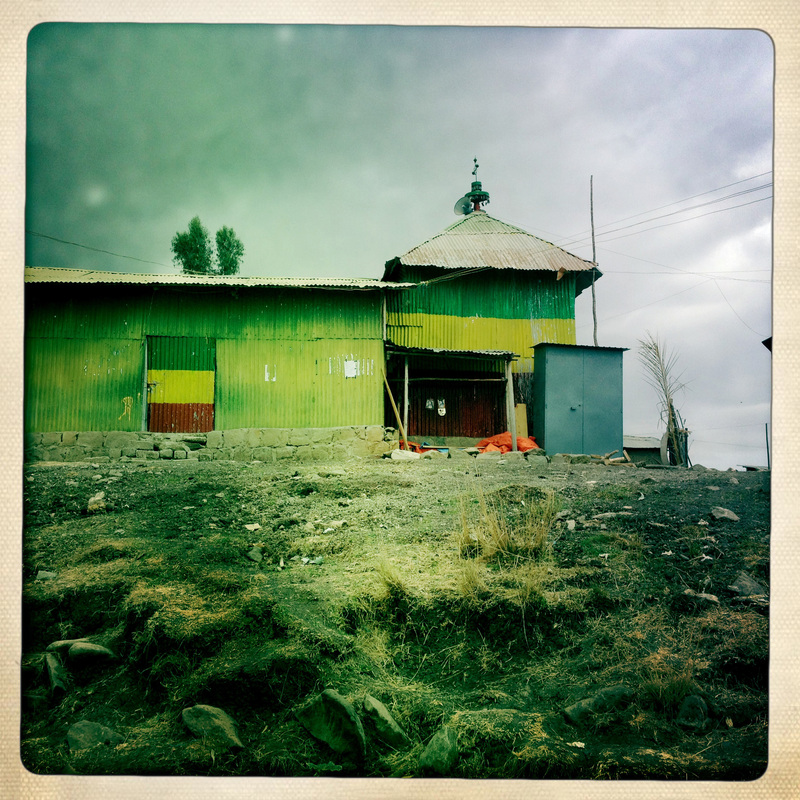 On the last day, Gudisa and I managed to run the 18km from the house to the village from which the bus went back to Addis in time to claim places on the bus home – I was a little concerned as we were told that after 7am all the seats would probably be gone. This adds extra pressure to trying to run up an enormous hill, but proved a good incentive. Having arrived just after seven we secured our seats and sat drinking coffee until the bus decided it was time to actually leave. There are two rushes for buses here. The first is often by people sent by friends or relatives to secure places on the bus for them, and the second is by those coming to actually claim the seats. As there is no specified departure time, this is all pretty confusing, and I was glad to have Gudisa with me! In all, we’d managed to get a good three days of training done at the same time as visiting one of the remotest places I’ve ever been, and I feel privileged to have experienced a truly Ethiopian Easter celebration. I realise I’m a bit behind with posting training, so the last two weeks are below. We’ve made friends with Binyem, who is in charge of access to the track in the National Stadium, which is good news for the next 5 weeks training. He is letting me train after the national squad, which means I turn up to watch them train and then do my session with some of the best runners in the world watching while they stretch on the infield. I shouldn’t think they’re hugely impressed. Watching Mohammed Aman fly through 22-second 200m repeats before you train has a way of getting you fired up to run, though. Unfortunately I won’t be seeing Bekele training there – he puts his recurring problem with calf injuries down to the track’s firm surface, and is spending $400,000 dollars on building himself a softer one 20km outside Addis. Sunday 1st – 12 miles easy. I still seem to have a slight cold. Monday 2nd – 8 miles easy. Tuesday 3rd – AM 4 miles steady. PM – 2 mile warm up, 2 sets of 7 x 400m with 1 minute recovery and 5 mins between sets in 71 seconds in the National Stadium. Wednesday 4th – AM 8 miles. Hard due to the mud that has accumulated since the belg rains started. PM – 4 miles on the road. Thursday 5th – AM 7.5 miles fartlek on a dirt road. PM 4.5 miles easy. Friday 6th – 8 miles steady. Saturday 7th – AM 2.5 mile warm up, 40 minutes ‘tempo’ on grass. Not too fast – in Bekoji at 3,000m above sea level! PM – 4 miles easy. Sunday 8th AM – 2.5 miles warm up, 400, 800, 400, 800, 400 with 1 minute recovery, 3 minutes rest, 400, 600, 400, 600, 400 with 1 minute recovery, 3 minutes rest, 4 x 200m with 1 minute recovery on the track in Bekoji. PM – 4.5 miles easy. Monday 9th – AM 8 miles, easy pace but still hard due to the altitude. PM – 5 miles easy. Tuesday 10th – 2.5 mile warm up, 10 reps of a hill that took about 1 minute 50 to get up, 1.5 mile warm down. Wednesday 11th – AM 8 miles easy. Felt ok considering yesterday. PM – 5 miles steady. Thursday 12th – 12 miles hard with group. Friday 13th – AM 2 mile warm up, 2 sets of 4 x 1km with 1 minute recovery and 5 minutes between sets in 3.06 average. PM 4 miles easy. Saturday 14th – DNR. First rest day of the trip. 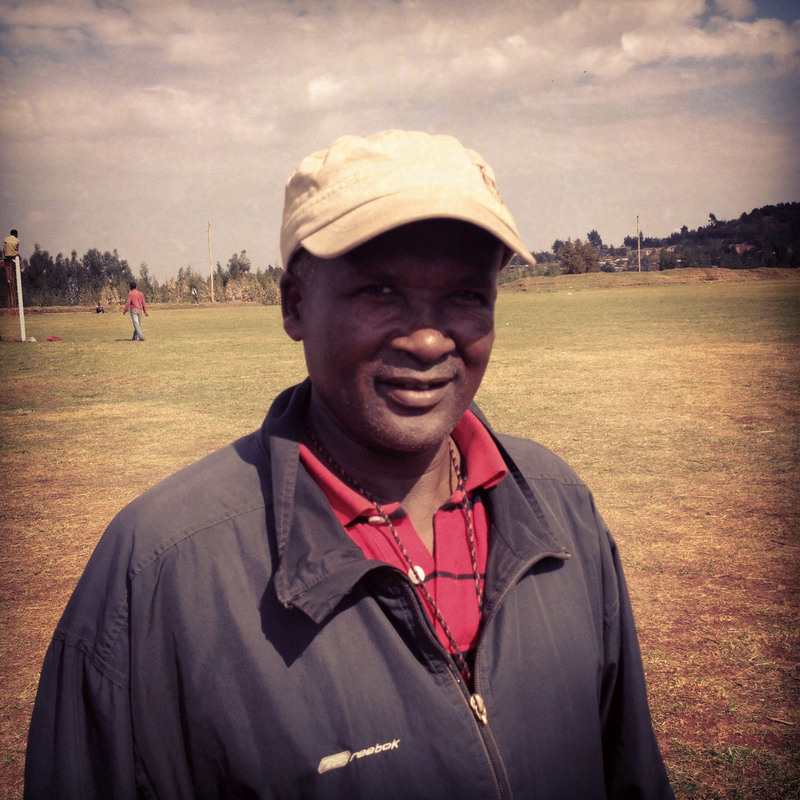 Bekoji’s coaching guru: Training with the man behind the world’s greatest distance runners. 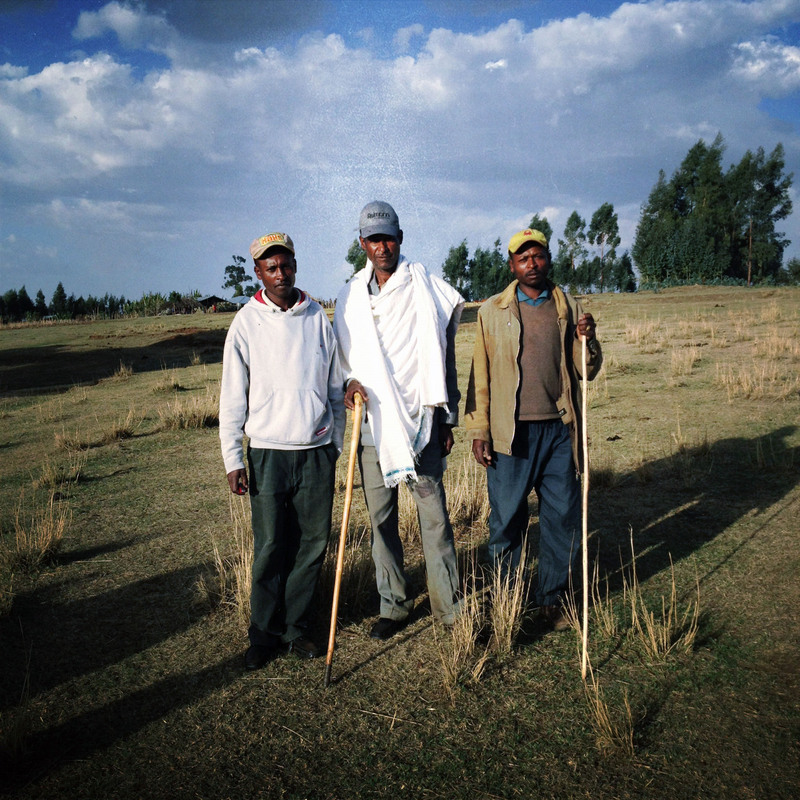 I spent 5 days last week in Bekoji, a small town about 200km from Addis at 3,000m above sea level. The journey – Gudisa said it would be ‘about three hours’ – took seven hours, so by the time we arrived it was too late to get any training done, and we arranged to meet coach Sentayu the following morning. At quarter to seven he came to meet us, and we ambled along his familiar route to the track, our progress frequently halted as ‘coach’ greeted everyone we passed. Bekoji is not much bigger than a village, and over the course of a thirty-year coaching career there aren’t many families who haven’t contributed at least one young athlete to Sentayu’s vast training group. 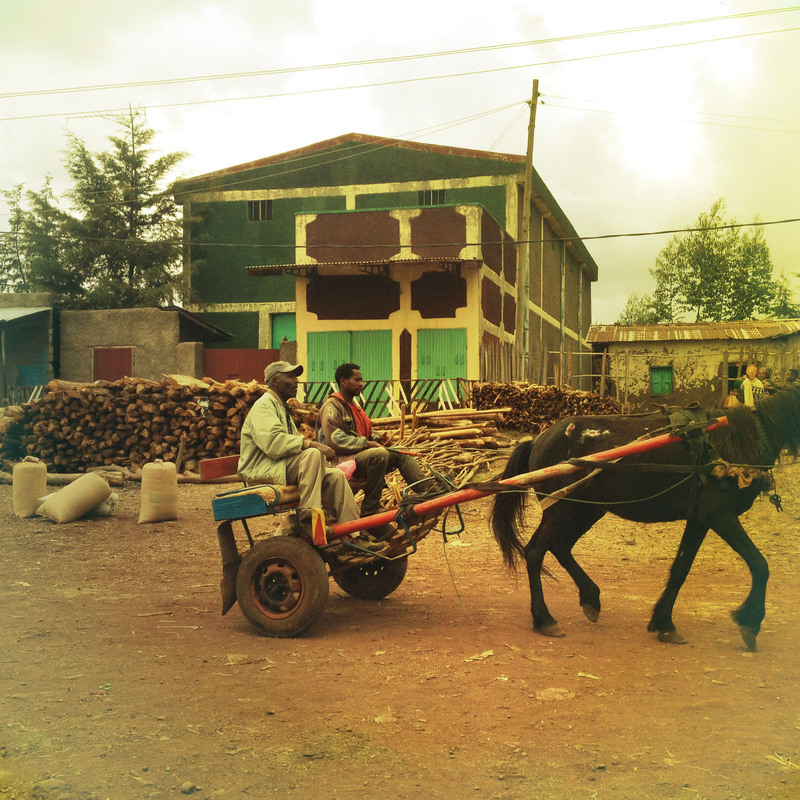 In the course of the short walk to the stadium we pass the houses in which both Deratu Tulu and Keninisa Bekele grew up. Bekoji’s few thousand inhabitants have a tally of eight Olympic golds and counting. I’ve been training in Addis Ababa for over a month now at 2,400m, so I’ve acclimatised pretty thoroughly to the altitude. The air in Bekoji, though, is noticeably thinner, and on the walk uphill to the stadium I was emitting conspicuously large amounts of water vapour in the cold morning air. 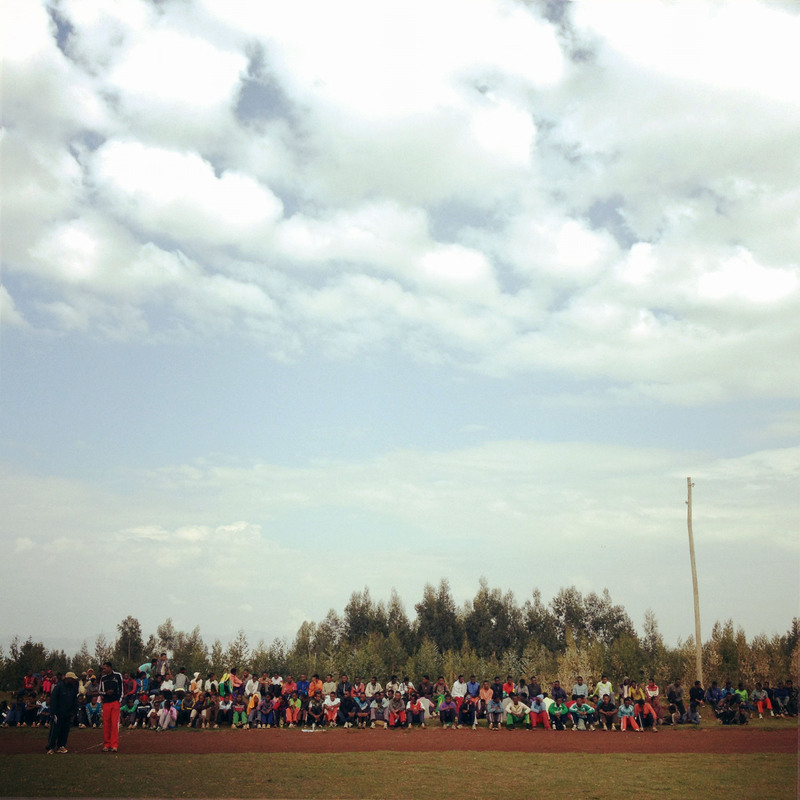 At the stadium we were greeted with the sight of 200 young runners sitting on the grass banks waiting to hear Sentayu’s words of wisdom. After a short pep talk we warmed up for twenty minutes – quite a disorientating process, with phalanxes of runners darting around the infield in various directions – and then got started with the track session for the day. Everyone was doing different things, and I was told to alternate 800 and 400 metre repetitions. Jim Ryun used to describe the wait for the sudden feeling of fatigue that hits you when you’re running intervals as being like waiting for a bear to jump on your back. Running in Bekoji you don’t have to wait too long to feel this way. Another runner joined me mid way through the session, and much to my surprise he was struggling to keep up by the end, which definitely helped to keep me going. Unfortunately for my ego, when I asked Sentayu about him, his response was ‘his name is Rata. He hasn’t got much power… or energy.’ I suppose by association he was implying that I didn’t either! Rata, my training buddy on the track. For anyone looking for training secrets from a man who has probably coached more Olympic champion distance runners than any other, I’m afraid to say training in Bekoji was very simple. Apart from the track session and a session of 15 (!) reps of a 500m long hill, we did a lot of slow running across farmland. The fact that you can do vast amounts of aerobic running on a soft surface in a beautiful place can’t hurt, but I think it’s mainly due to the altitude that the runners here are so good. When I ask his opinions on the most important forms of training for 10km runners his response is succinct: ‘Short hills – for strength here (he grabs his hamstring). Long runs, for endurance (more deep breaths to indicate aerobic training). And speed.’ To emphasise his final point he banged his fist on the table, the cadence and volume increasing until he has the attention of all the other customers in the café where we had breakfast after training. Back in Addis this morning I did the best job I’ve done so far of keeping up on a 12 mile ‘hard’ run with the group, so hopefully his short period of tutelage has helped to an extent. I thought I’d start this week with a question that’s been bugging me since last weekend. I’ve been able to watch most of Newcastle’s games since I arrived here, in a kind of corrugated iron barn attached to a bar near where we live. They seem to have access to all sorts of channels, and usually find the Premiership games on one of the Arabic sports channels. Access to the barn costs two birr (about eight pence), and so far I haven’t seen anyone buy a drink. People seem to arrive for the first game of the day and stay for the whole afternoon. What struck me last week was the fact that most of the people in the barn were passionate West Brom fans, and seemed pretty knowledgeable about the club and players. Why would anyone lacking a geographical connection to West Bromwich decide to support them? Obviously I’d have found it easier to understand if I’d been in a room full of adopted Geordies, but of course with Newcastle’s current blend of French-Senegalese flair, who could blame people for supporting them? 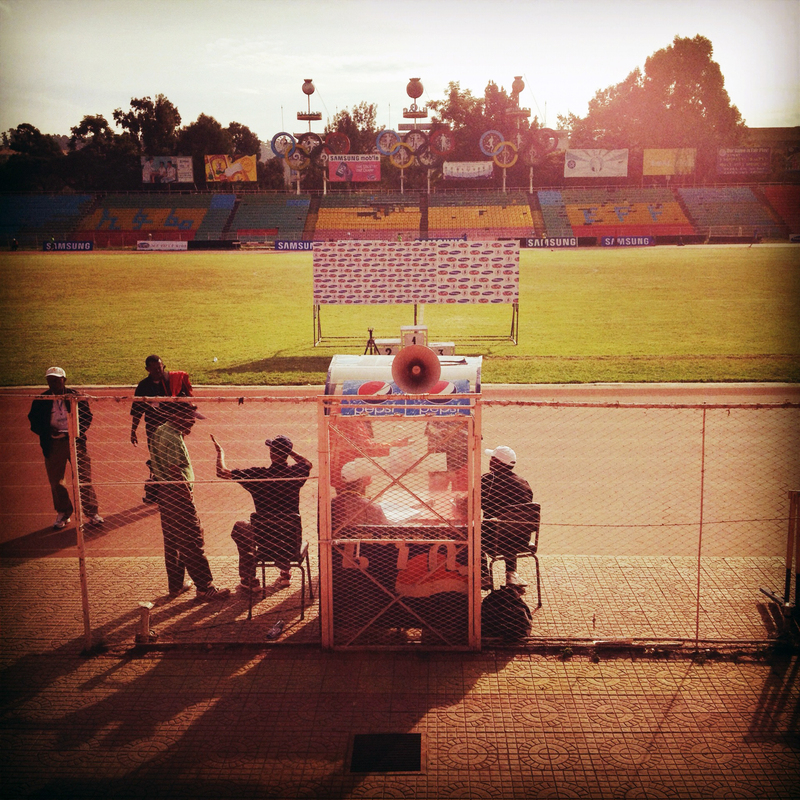 This week I was finally granted access to the National Stadium, to train on the only all-weather track in Ethiopia. Scottish Athletics provided me with a letter of recommendation, which I’ve been taking to the Ethiopian Athletics federation every couple of days for the past three weeks, in the hope that the only man who actually has the authority to do anything would be there. The Chief Executive is also a House Representative in the government and, apparently, has fingers in numerous business pies too. In spite of the fact that there are around twenty other members of staff, their main function seems to be to check facebook accounts and watch twenty-four hour news, and there was no way anyone else was going to be able to do so much as stamp a letter without the chief’s permission. The advantage of spending so much time in the Federation is that I met Mohammed Aman (world indoor 800m champion), and Gebre Gebremariam, who seems to be a bit of a player. He was distracted when Richard and I asked him to sign some vests by two girls from the National team, who he kept pushing together, saying ‘inshallah.’ Perhaps he was expressing his hope that they’d both end up on a podium together in the Olympics, but I’m not sure. 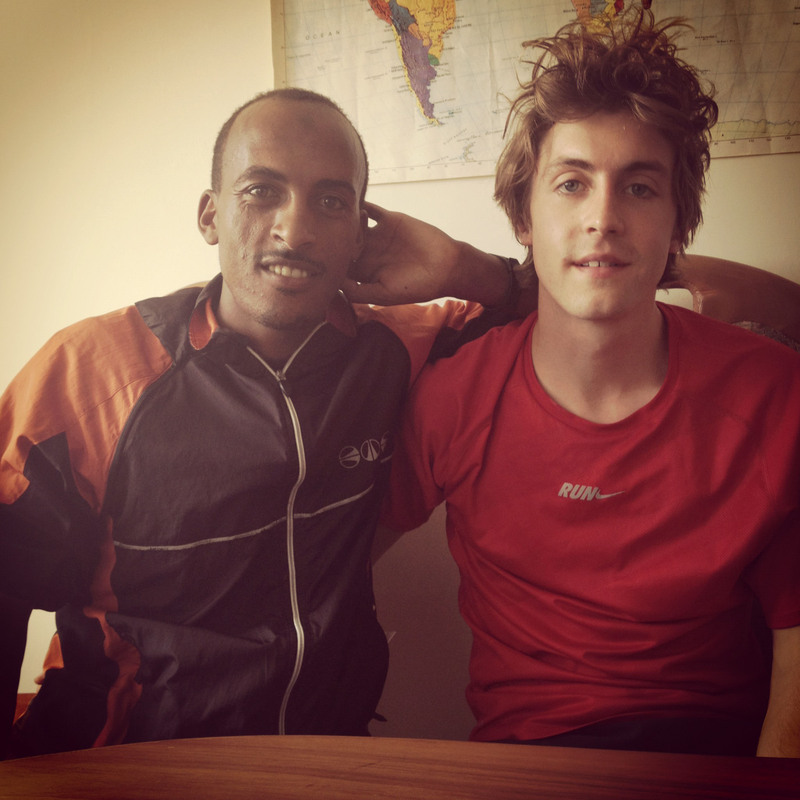 RAB are currently trying to get a visa so that Edau (above, left) can run the Balmoral 10km. Given that he can run 29 minutes for 10km in training at 2,400m, he shouldn’t have too many problems winning the race. Getting permission to travel to the UK is usually far more difficult, however. The Climate Change Forum are also facing a few problems with bureaucracy, as the government has just passed new laws regarding the financing of NGOs, which reclassify a lot of expenses as ‘administration costs’ which used to be ‘programme costs.’ As NGOs are obliged have a ratio of 70:30 of programme and admin costs this obviously causes a few issues, and apparently DFID are being forced to hire lawyers to protect the projects that they have under way at the moment. 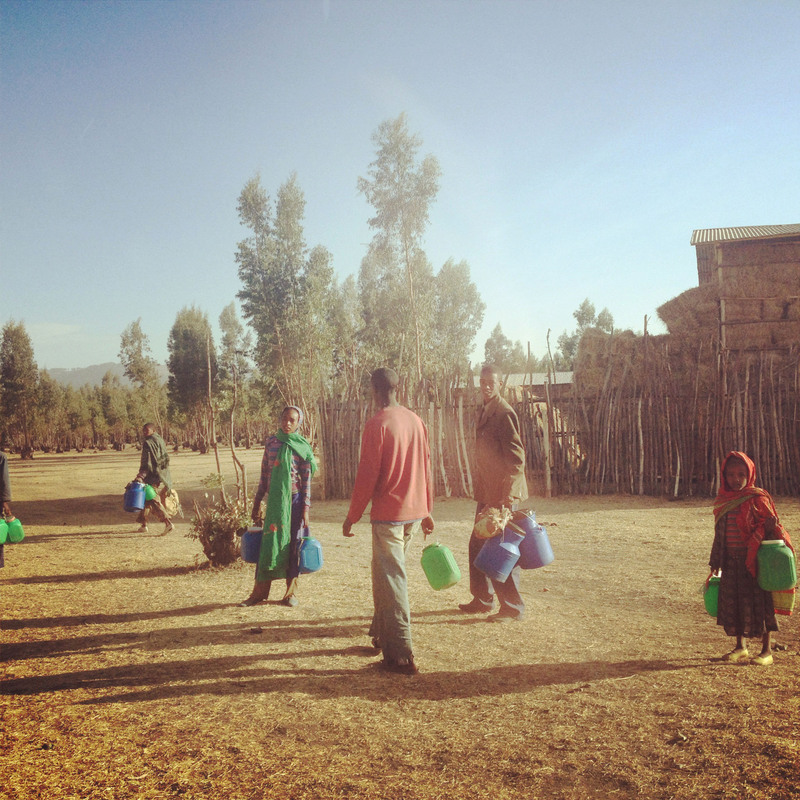 The preparations for Earth Day in Ethiopia have been seriously affected by the new rules, and so have plans to carry out small-scale community projects in May (which are somehow now ‘administration costs’ too). The tightening of regulations on NGOs goes back to the elections in 2001, when numerous civil society organisations accused the government (which is still in power now) of vote rigging. With another election coming next year, the government has banned any organisation that receives more than 10% of its funding from abroad from undertaking any activities in human rights, gender equality, children’s rights and a host of other issues. On a lighter note, here’s are some photos. The first is a picture of my next door neighbour, Eyo. He doesn’t care for trousers. This is where we trained on Saturday. 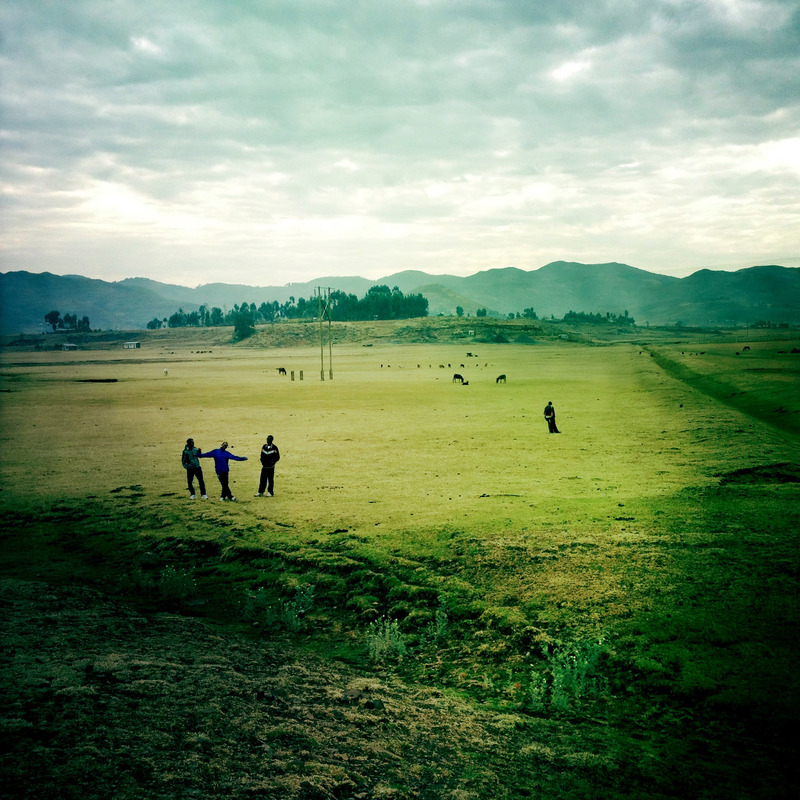 It looks like Edau is doing some kind of dance, but it could be one of the many elaborate Ethiopian stretches. Sunday 25th – AM 12 miles steady. Wednesday 28th – AM 7 miles easy. Slight cold at the moment. PM – 4 miles easy. Friday 30th – AM 8 miles steady. PM – 4 miles easy. Saturday 31st – AM 12km tempo run at 2,700m in 41.01. Pretty tough. PM – 4 miles easy.